The latest edition of Prof Greg Brooks’ work provides important insights – and raises questions. We’ve been reading with great interest the updated edition of emeritus Professor Greg Brooks’ ‘What works for children and young people with literacy difficulties? 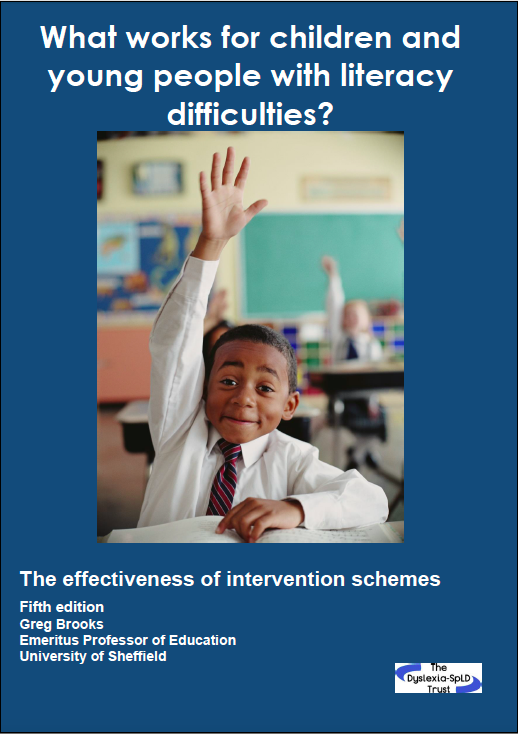 The effectiveness of intervention schemes’. Professor Brooks has a strong overview of literacy interventions in reading, writing and spelling, having completed this analysis five times since 1998. Implication: When establishing value for money, long-term impact and savings in future budgets for special needs must be considered, particularly when helping the lowest-attaining children. The reasons for not mentioning 14 of the  RCT evaluations in this report varied: non-significant findings, implementation or sampling problems, small samples, high drop-out, … which all go to show how difficult it is to produce robust and reliable findings, even (or especially) when rigorous research designs are adopted. The sections on literacy interventions at secondary level (p. 157, p. 255) are obviously most relevant for us. For us, the most striking element is how few interventions exist where pupils are expected to catch up completely. Thinking Reading appears to be the only one where the time frame is open-ended: students graduate from the programme once they are reading fluently at their age level, and so the number of lessons depends on how far behind they were when they started, and their particular rate of progress. Is the EEF producing sufficiently useful evidence, given the scale of the government’s investment? Given how little has changed with respect to literacy attainment, what do school leaders need to do to improve outcomes for lower attaining students? What beliefs or entrenched interests are preventing us from implementing effective interventions, when there is clear evidence that this is realistic and practicable? All students catch up to their chronological age in reading remarkably quickly. In the four schools that shared progress data for our July 2017 evaluation, the average gain was over five years per student, and the average rate of progress was two months per lesson. Students were in the programme for an average of seven months (including school holidays) and progressed at a rate of nearly nine months for each month of intervention. Thanks, Dianne. Your post touches on many of the problems encountered in ascertaining which programmes work best. Of course, as you’ve remarked many time, it would be so much better if we didn’t have these problems in the first place. Although Sounds-Write is used as a catch-up intervention in many primary and secondary schools and has a very good track record in this area, we have never participated in Greg Brooks’s surveys. Initially, in 2003, when we first started, we did try but we came up against the problem of being unable to make reasonable comparisons from the data we tried to collect. Among other things, teachers want to use different tests, they forget to pre-test, they don’t post-test at the end of an agreed period of intervention, and they don’t post test six months after the end of intervention (to see if the effects have washed out). But, most important of all, the periods and frequency of intervention sessions and the attendance of each individual pupil are not usually carefully monitored. All of this this makes the collection of data extremely problematical. It’s also the reason why we decided to go for collecting data on KS1 and KS2 classes, which, we think, gives, over the period of a whole year a more with follow-up year after year, a reliable indication of how successful a programme is. Unfortunately, not even a comparison against the population against which the tests are normed and standardised is enough for some (Dorothy Bishop, for example). A truly rock-solid study would have to be an RCT – but who is going to undertake it?